A recent invitation from The Moms to preview the movie Frozen (Disney’s newest animated film) was highly anticipated by both Lucia and Adrian. Thanks to The Moms, my kids have had incredibly memorable movie experiences (I mean, Adrian’s first movie involved meeting Pit Bull!). I imaged that we would be in for another treat with a special movie day, and Q & A with the lovely Idina Menzel. Frozen tells the story of two sibling princesses in the Scandinavian province of Arendelle – little Anna and her older sister Elsa. After an early childhood incident, Elsa struggles with being ordered to suppress her emotions to conceal her ice evoking powers. Anna eventually embarks on a journey to find Elsa and help reverse Arendelle’s eternal winter. The story unfolds in the most visually stunning way, with spectacular animation and memorable tunes. Brava to Disney for stepping away from the typical princess love story trajectory – as the true love among sisters ultimately saves the day. The kiddos enjoyed the movie and I believe that all attendees were smitten with Idina Menzel’s powerful presence. Lucia asked Idina “what super power she would want?”, to which she responded: “a super power to make sick kids better!”. The Q & A culminated with an acapella singing of Let it Go per the request of a young attendee. It was beyond amazing! Lucia naturally donned full princess attire to the movie premiere and left with a new found princess obsession (and adoration for Idina Menzel). I thought that a bit of secret sewing for an upcoming secret vacation (and 6th bday!) was in order and decided to recreate Queen Elsa’s costume. I purchased all of the material at Jo-ann Fabric and highly recommend princess-dress-making shortly after Halloween (costume material is marked down substantially). I began with a white leotard and cut off the bottom. I made a skirt out of poly-satin and attached it to the cut-up leotard (for a good visual on how to do this visit my friends at Hungie Gungie). I then intended to use a pressing cloth and seam-a-steam to set a fancy-smancy sequined bodice in place. That didn’t work, so I had to manually lift up the sequences piece by piece to sew the bodice into place. I only stitched around the top of the sequence material as the weight of the material hangs flat very nicely. I cut small holes in a vertical lines through both back sides of the sequined material (that wraps around the back) to create a ribbon corset to tie into place. I then hemmed and gathered sheer snowflake material to create a cape that I secured above the bodice underneath the arms. I secured a few jewels to the leotard with a stone setter and added a sparkley button to complete the look. I can’t wait to surprise Lucia with a bit of homemade love – possibly when we enter Walt Disney World! UPDATE: View more dress photos in my Walt Disney World post. Thank you to The Moms for providing tickets to the Frozen Movie premiere event. All opinions and Queen Elsa costume tutorial are my own. We saw a few previews for this over the summer and my boys are dying to see it! The movie opens today! My kids loved it. There are a few scary parts – just so you know! Is there anyway you could make this beautiful dress for my daughter for her birthday party? If so, how much would it cost? When is her birthday party? Hi Michelle – I hope that you received my email. At this time, my work from home schedule doesn’t leave room for a little sewing business, but I greatly appreciate the inquires (you all have me thinking!). Anna – we didn’t have a party, but we took the kids to Disney world. I will be sharing that post soon with lots of dress photos. THAT IS BEAUTIFUL!!! She is one lucky girl! That dress is adorable! My family is looking forward to seeing Frozen too. Thanks Pam – the movie is great! I love the message and the ending. Oh how cute! My daughter can;t wait to see this movie! I think it’s a good one for the girls. There are a few scary parts but the message is fantastic. Your costume is so fantastic! Can you please explain how you sewed the sequenced material on? Hi Clara. I intended to use seam a steam to secure the sequence material in place – but it didn’t work. The material is think and I had to put a pressing cloth over. The glittery pieces most likely would have broken my needle (even a a heavy duty one, I’m guessing). There is a small space of material underneath each row of sequence. So I carefully lifted up each piece of sequence (starting at the top row of the bodice) to sew underneath to secure the top of the bodice. This is all just trial and error for me and I imagine that there is most likely a better way to do this. I had to be carefully to not run over my finger! The sequence material was cut to hang over the part of the white leotard that I cut and attached to the shirt that I made. So I only stitched along the top row of the material and wrapped the material a bit around the back. I then cut holes in the back of the sequenced material (not the leotard) and wove a ribbon through to tie up like an adjustable corset. If this does not make sense, please feel free to send me an email. I’m happy to send more info and photos. Thanks for visiting. I found sequined fabric online that closely resembles the dress top. It’s on the Harts Fabric website and is called “Rain Drop Sequin Mesh Fabric” aqua #66906—-and it’s $26.99/yard —-a bit expensive. How much fabric did you purchase for the corset? I love this dress and I have purchased all of the materials to make this for my 3 year old. But, I would love for you to send me a picture of the back of the corset where you laced up the ribbon so that I have a clear understanding (and clear visual0 of this part before I begin. Awee thanks so much. I can’t wait to give it to her. Hi Monica, abiut how much did this cost to make, if you don’t mind me asking? It’s gorgeous. Hi Annie – I don’t remember the exact cost of the materials – JoAnne Fabric’s always has coupons though! That is so pretty! She’s going to love it. I’m looking forward to reading all about your trip. Have a great time! Thanks so much for stopping by Lyla! We are excited! The dree is just ridiculously fabulous! Lucky Lucia!!!! Thank you Katy! I’m hoping that is doesn’t fall apart! I think that the movie came out in theaters today? Your dress is fantastic! Thanks so much Gloria – my daughter wears it practically every single day! This is the only Elsa tutorial that I have found! Thank you! This dress is perfection! I love love love how you used a portion of a leotard. The fitted top is ideal for a princess costume. How did your daughter like it? Hi Anna Maria – my daughter LOVES the costume and has worn it on 2 plane rides, Christmas, her birthday and nearly every single day. Thanks so much for the kind words and for taking the time to comment. Can you send a pic of the back of this dress? I want to try making it but I think a photo of what you did in the back would help. It’s beautiful! Hi Christine. I’m going to take photos and send to you within the next few days. Hi Vicky. Thanks for visiting. I purchased all of the material (with the exception of the leotard) from JoAnne Fabric. The first layer of the bodice is made out of the cut-off leotard top. I’m sorry that my tutorial is unclear! The sequin overlay is material (not a ribbon). This material has square plastic tiny rectangular chips on it. Please let me know if you have any more questions! Thank you! So bummed…I can’t find ANY material like that at my local Joann’s 🙁 Can’t seem to find it on their online store either! Wah! I’m going to try to make do with the circle shaped sequined fabric I found, though. Fingers crossed! Beautiful!! Did you find the blue sequined fabric at Joann? I couldn’t find it at my store or online. Hi Pam, the blue sequined material is from JoAnne – it has tiny sparkly rectangular chips on it. Hope this is helpful! Can you send me a few extra photos of the back of the dress. I purchased a sequin material and im wondering if i will be able to sew it on to the leotard. How did you attach the skirt to the leotard? did you use the elastic thread that your friend used? Hi Corrie, I didn’t use elastic thread like my friends over at Hungie Gungie did in their tutorial. I would definitley use the elastic thread if you can, because it will give this dress more stretch when putting it on and off. I didn’t have any, so I went with regular thread. 1) I first cut the leotard and then gathered material to make a skirt. The Hungie Gungie tutorial gives a clear visual of how to line the pieces up to sew them together correctly. 2) Next turn the skirt inside out. 3) Then, insert the cut-up leotard (neckline first) into the skirt. Make sure that the leotard top and skirt are now right sides together. The tag inside the leotard neck should now be aligned with the back seam of the skirt. Please reach out if you have any more questions. I’m going to try and take photos today to respond to all those who have asked for my details! Did you serge the leotard ? I am planning this one but wasn’t sure if it would fray. I don’t have a server, but my neighbor does. I’m not good enough that I am ready to commit to the investment right now. Such a pretty dress! The stores seem sold out of my child’s size, so I’m starting to look into making one myself to fulfill a Santa wish. The part with the sequins is the one that I can’t wrap my head around. Does that fabric have some stretch to it? I’m trying to understand how, when the leotard top stretches out, the sequined top will go with it. Hi Kelly, The sequined material doesn’t have stretch but it does have weight. I only sewed stitched around the top so the material hangs nicely over the attached skirt. The corset lace-up in back holds the sequenced material nicely in back and can be adjusted if the child grows a bit. It’s so georgeous!! where did you get the snowflake material? Hi Sonia – all of the material (including the snowflake material) was purchased at JoAnne Fabric in November. Hi. I love the dress and trying to make one for my daughter. Can you please tell me the name of the snowflake material you used? I greatly appreciate it. Hi Michelle, I hope you received my email. I don’t have a name for the snowflake material – it was purchased at JoAnne Fabric. Gorgeous, only pin ive found. How much material did u use? Kelly – I’m so sorry, but I don’t remember exactly. I think I bought a yard and half for the skirt portion, a yard for the cape and half yard for the sequence. I did have left over material. How much money did it take to buy it all? My daughter is ten and is absolutly in love with frozen and is going around pestering everbody about how to make enough money to either buy a costume or make it, I am exhausted and currently looking for an easy way to stop her pestering. Please answer soon! WOW! This dress is amazing! I wish I was crafty in the sewing department. I am curious….do you or do you know anyone that would be willing to make this dress if I provide the measurements. Like most children (and adults), my daughter (who is 5) is in love with Frozen and wants a Frozen party in April. She wants to be Elsa and I would love to find something beautiful and unique for her to wear. Please let me know. Thank you so much and Happy New Year to you! Hi Heather – I’ve had a ton of requests to create more and I’m so sorry but at this time I’m not looking to sell. Best of luck and thanks so much for visiting. Hi. Beautiful dress! Love your tutorial! ..and the idea of using a white leotard as a base. I think I get how to do the back, but if you have pictures of the back of the dress (corset part). I think I get it, but some pictures if you have them would be helpful. Thanks!!! Hi Patricia – Thanks for the material info! My son wears a blanket Elsa cape too! I will send images of the back. Best of luck! Hi Michelle- I hope you received my email. I don’t know the name of the material – it was purchased at JoAnne Fabric. I don’t know anything about sewing but this project doesn’t seem hard. Was it easy to make? Hi Felipa! It is easy! Best of luck and thanks so much for the comment! Es un vestido precioso, a mi hija le ha encantado y voy a intentar hacerselo porque adora a Elsa. Me gusta tu web. Un abrazo Granada, España. Love it! I would also appreciate pictures of the back and where the Cape attaches. Thank you! I was wondering if you make this dress to sell. My little girl’s birthday is coming up and she loves this movie. I was trying to find a dress for her. Your dress is perfect. You did such an amazing job. If you did sell it how much would you charge? Hi Ashley – I hope that you received my email! At this time – I’m not able to make this costume to sell. I hope you find what you are looking for and happy birthday to your little one. Hi Tiffany – I’m sorry I’m not able to make it for you – the dress is fairly simple to make if you can find someone with sewing skills. Good luck! This is soooo beautiful!!! Your daughter must be very happy!! I hope I am able to make one to surprise my daughter. She loves Elsa so much that she’ll watch Elsa singing Let It Go every night before bed. Shawn – thank so much for your message – all the way from Malaysia! I would love to see your version of the dress! Can you please post the names of the fabric and the amount of each you used? I have been looking at all joAnns around and have not found any if the fabric. I was wondering where you found the white leotard. Many stores I find only have black and pink. Thanks for the info!! Love this dress. I want to try to make one for my daughter. Never mind:) I found one at Party City w/ free shipping for 9.99. Glad you found it and hope you received my email! Kristin- I’m so sorry but I don’t have the names or item numbers of the material and unfortunately don’t live anywhere near the store. I hope the photos are helpful. I purchased a yard and half for the skirt a half a yard of sequenced material and a yard for the cape. I had leftover material of all fabrics. Happy Birthday to your granddaughter! I’m so sorry – but at this time I’m not making these to sell. Best of luck! What an amazing dress! I was in the process of making one for each of my daughters too when I came across your website. It really looks the part…wonderful dress. Have just finished our dresses…girls are thrilled and now going to attempt Anna’s dress! Don’t you just live girls?! This is absolutely amazing and beautiful and creative! I love the use of a a leotard. I wish I could make this myself! Can you make 3 for me? I will email you! Thanks so much for your message Rosalin. I’m grateful and humbled by the kind words. At this time I’m not able to make them to sell – my work from home writing gigs don’t leave much room for a little sewing business. Thanks! Hi, your dress is lovely! 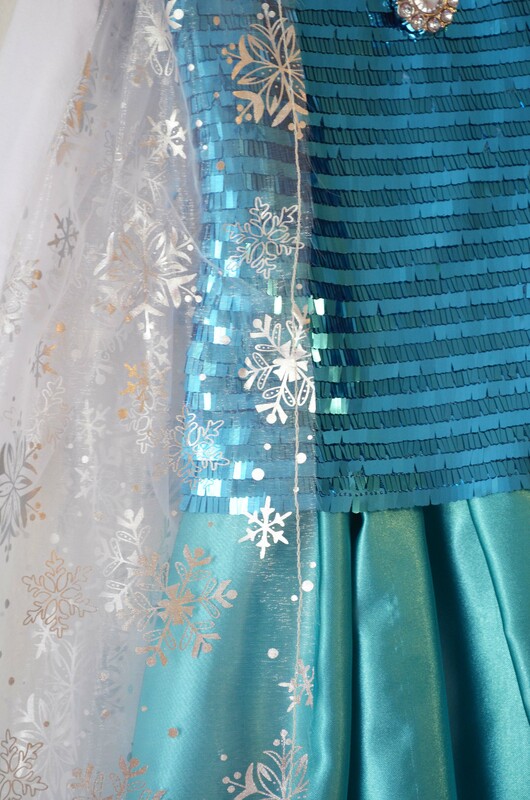 I was asked by my daughter to make her Elsa dress for a coming party and I’m improvising a bit, but the snowflake tulle you have used would be a godsend!! Can you please let me know where you found it? Hi this is perfect, exactly what I’ve been looking for! I’m in the middle of gathering fabrics to create my own version of Elsa’s dress for my daughters. 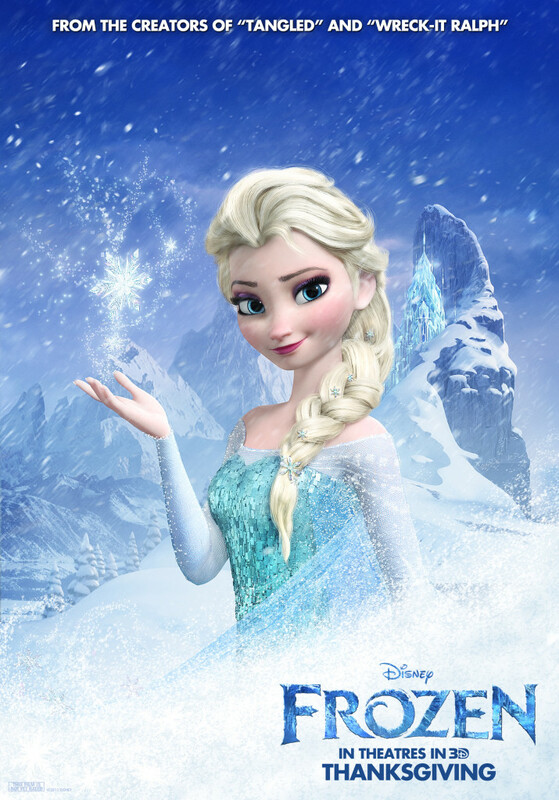 Like many before me they have an event coming up “Frozen” themed…seem these days that everyone is doing one. Would you be so kind to send me photos of the back of your dress. I think I get it but I need a visual. Thank you so so much! Congrats you did a fabulous job! Hi there. Is there anyway you could send me some more pictures of the dress. Especially the back? I’m just curious for a visual of what you did. Thank you! It’s so cute!! I will repeat what everyone else has said…your dress is beautiful! I want to make the dress for my granddaughters and would appreciate the photos of the back of the dress also. Actually any photos would be great. Thank you so much. I am extremely motivated to get the dresses done by March (one of the birthdays)! amazing!!! I wish I had your talent!!! Your daughter is one lucky lil princess!!!!! Can you email me any additional pics and would appreciate the photos of the back of the dress also. Marina, thanks so much for the inspiration and the tutorial. At this moment, it is very hard to find an Elsa costume to buy- sold out everywhere (at least anything affordable!) 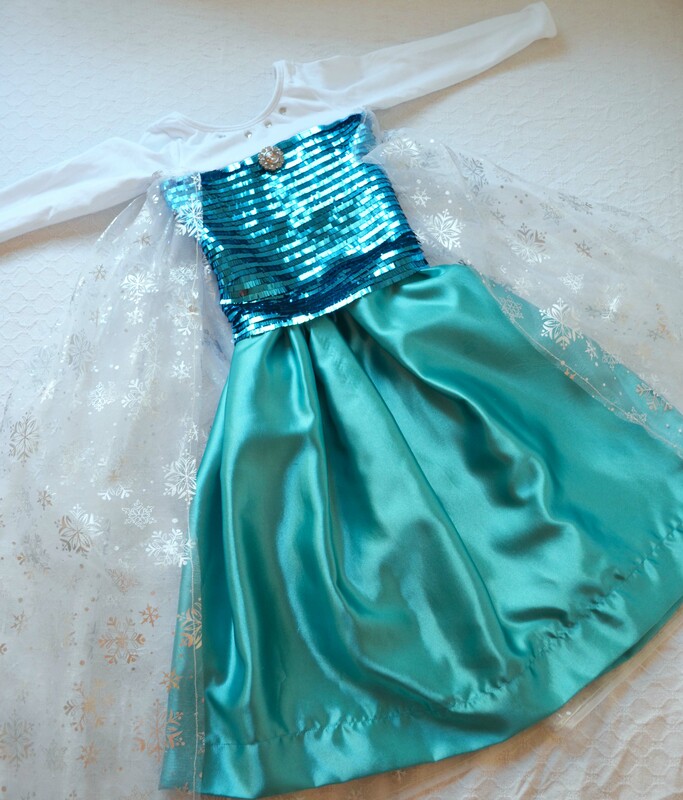 I took your tutorial and added my own touches to make an Elsa costume for my 5 year old grand daughter. She’s obsessed with the movie; she knows all the songs by heart, and is going to the sing-along this afternoon. I got her dress done just in time, and it’s beautiful! Can’t wait to give it to her so she can wear it today 🙂 Thanks again!! Where did you find the snowflake material? I can’t find anything anywhere! I purchased all of the material (including the snowflake) at JoAnne Fabric in early November. So many readers have said that they can’t find it and I think that it may have been a seasonal fabric as I found it on a rack with other holiday themed prints. This is just amazingly BEAUTIFUL!! I did not get a chance to read all the comments left. However, do you make these for purchase? I have all my fabric but I would LOVE LOVE LOVE any more pics you could send me, especially the back. I am not a sewing mama, but I promised my girl to do it before the trip!!! And since she wears a 12 (she is 7 and TALL), I would have never been able to do this. So THANK YOU!!!!! you have done a magnificent job! I have seen Elsa costumes at around $200 – $1000+ for them! Absolutely beautiful dress! Thank you so much for posting. My daughter is asking for an Elsa dress and I think it is ridiculous what they are charging for them. I am new to sewing. I think I get the idea of what you did with the back but was wondering if you wouldn’t mind posting some additional pics. I think I would like to attempt making a dress for my little girl (pending I can find everything I need!) thanks again for posting. Love it! Thank you, it’s only February and my grand daughter has already told me she wants to be Elsa for Halloween. So I’m on the hunt. Thank you you’ve made my job easier. She was Repunzel last year and Cinderella the year before. I’m getting quite good at prince costumes!! Will state gathering supplies now. I am so impressed with this costume, I can’t wait to get started on it! Can you also send me pictures of the back of the dress please! Thank you so much!! Hi there! I am so relieved to find this blog of yours!! All the way from Singapore here! First of all , I’m really excited to make this for my daughter. First of all , just wanna know , how did you attached the cape and the corset? Any close ups will be great and what was the material for the corset? Eagerly waiting to hear from you! This is so beautiful! I would love some close up photos of the back if you get a chance. You are one awesome mom! I am a novice sewer (??) and would LOVE to make this!! Wondering if you could share how you made the bodice? I think I understand how to put the pieces together and found a pattern for the skirt… Do I need a separate pattern for the bodice or?? Thank you SO much! I love your dress. How talented you are. I’m trying to make one for my 5 year old who is obsessed with Frozen. I would love to see some more pictures of the back of the dress without the cape covering it so I can see how you did the ribbon tie up part. I hope mine looks half as good as yours!!! Do you have a picture of the back of the dress before the cape was added? Would you ever make one and sell it?? Hi Candice. Thanks for inquiring and I’m so sorry but I’m not making these to sell. Just like the rest of your followers, I too, am going to try to make this beautiful dress. I would love any additional pictures of the dress that would help this process. Thank you SO much! My 4 yr old is going to a princess ball with her daddy next weekend. Of course she doesn’t want to be any of the 8 princesses she has a dress for already:)! She must be Elsa! I found all the fabrics now I just need to see the back of that adorable dress so I can make it in time for the ball. Please would you send me the much desires pics of how you finished off the back and a little more detail on how you’ve attached the cape. Thanks! The best Elsa dress out their!! You are a highly talented designer and this Frozen Queen Elsa costume is even more beautiful than anything that I have seen in stores. brava miss Monica!!!!! Flawless costume design! I will recreate for my niece!!!!! HI Isabella. I’m so sorry but I don’t know the name of the fabric. When I made the dress..I didn’t have the intention of writing about it and I didn’t look at names or item numbers. It was purchased in early November and a lot of readers mentioned that they had difficulty finding the fabric. Thank you so much for posting this tutorial! 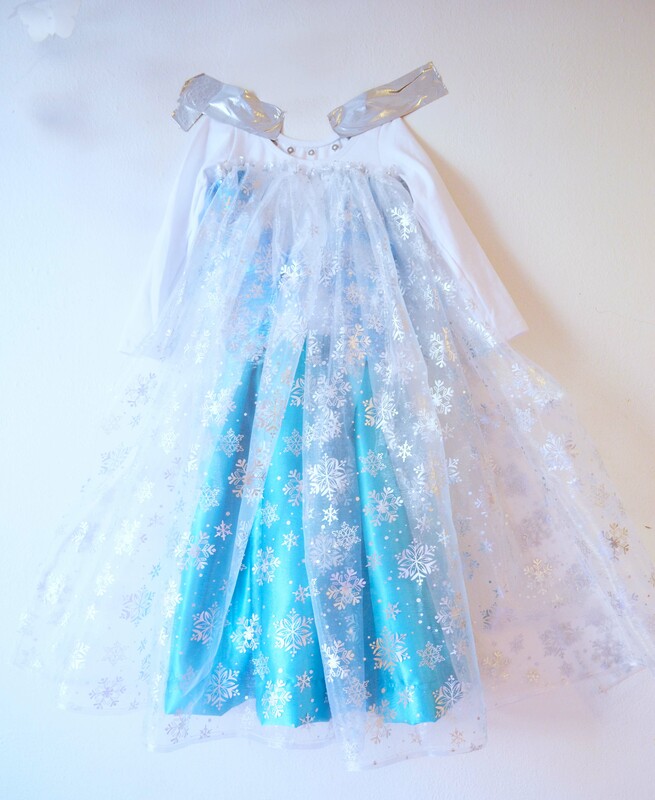 I just finished a dress for my 4 year old daughter today and she wore it to a Frozen princess party. 🙂 She LOVES it! I put a strip of elastic on the back of the skirt so she could get into it easier. And I used vecro on the cape to make it detachable. But those were really the only changes I made. This tutorial helped me so much! Thanks again! I loved your blog and the costume is fantastic! Can you please email me specific instructions so I can save it and use it for sewing the costume. I need to explain it to someone and she will try to make it for my 7 year old! Hope it’s okay to ask! I love your dress and want to make this. If you have any time to send me any extra picture you have, especially the back, it would be much appreciated! Your dress is absolutely beautiful! If you’re sending out photos of the back to the previous ladies could you please CC me? I’d love to get a better look at the how you did the corset closure. Also, how far up does the skirt go? I wondered if you made an empire waistline like the pillowcase tank dress. Thanks so much for any additional info! Can you please email me a picture of the back corset closure, too? And I have the same question as Megan above; did you attach the skirt empire style or at a more natural waist level? I went to our local fabric shop yesterday with my 2 girls (this was a nightmare) and bought Frozen fabrics. I had a bit of an idea of how I was going to make them. I even stopped at a shop on the way home and bought 2 long sleeve t shirts to attach the costume to. I thought about it all night and couldn’t quite work out how I was going to attach it all together. This morning I found your tutorial and it all came together so easily. Thank you for your simple easy to follow instructions. The cost of each costume was $16 Aussie dollars. A store bought costume here is $40 each and they are all sold out. I have 2 very happy little girls performing the songs as I type which is priceless. You are very clever! I am the same as many of your previous readers in that I’d love to make something similar, but come unstuck with the back of the bodice. I’d love any help in the form of photos or words to help describe how I get it right. I have all the materials, and even found some cute white gloves, my little girl is desperate for an Elsa dress. I love gowns and dresses! E&A. Love this dress! I have two granddaughters who would love it! Would you mind sending a photo of the back, please? This is amazing and the best Elsa dress on the internet. Frozen fans will hopefully find their way here! You are so smart and I’m glad I found this tutorial. Here I was pricing materials and dreading the process of sewing a bodice and attaching sleeves. So glad I stumbled onto your blog! I will be tackling this project for my daughter! I would also love any other picture of the back or how the cape attaches. Thanks!! something to do with browser compatibility but I figureԀ I’d pst to ⅼet you know.